Erickson and daughter, Noor, in Morocco. Cloe Medina Erickson, ACF President, has received a research grant from the American Institute for Maghrib Studies. Erickson will spend 10 months in Morocco researching cultural preservation in Morocco’s rural regions. Erickson’s research will complement ACF’s cultural preservation initiative by building off our past lessons and projects and preparing us for a new era in preservation in rural Morocco. Follow along with ACF President, Erickson, on her research journey. 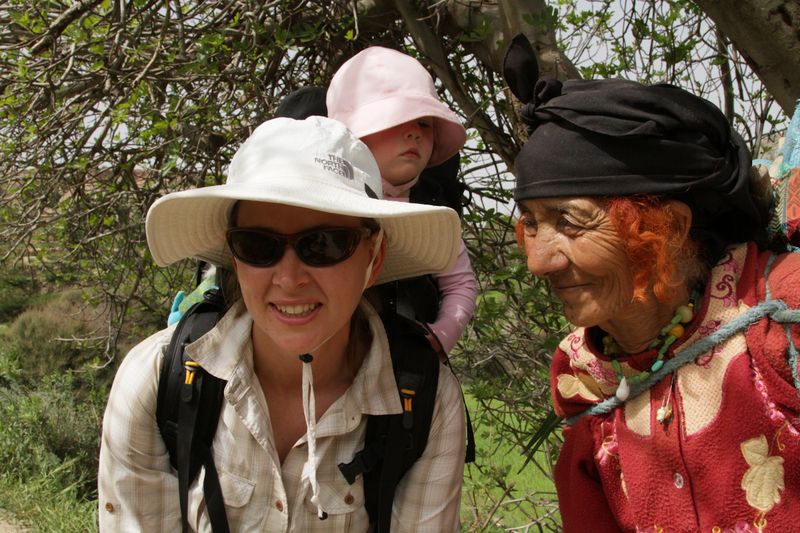 Erickson will be posting regularly to a blog that will chronicle her journey doing research, community development in rural Morocco with her three year old daughter in tow. Keep up on her research, the goings on of the Atlas Cultural Foundation and personal insights into spending 10 months in Morocco. 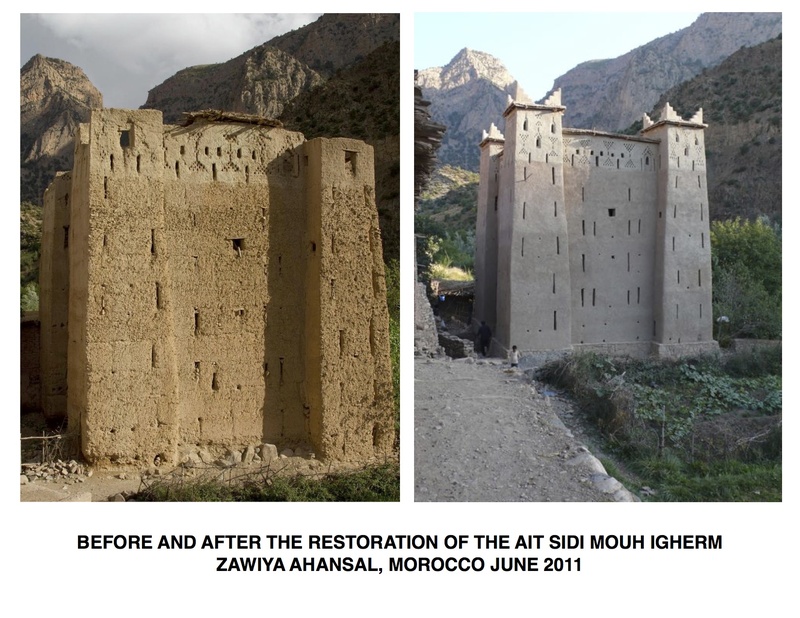 Conservation of Morocco’s Rural Built Heritage: A Non-Renewable Resource at Risk in the Face of Emerging Rural Development. 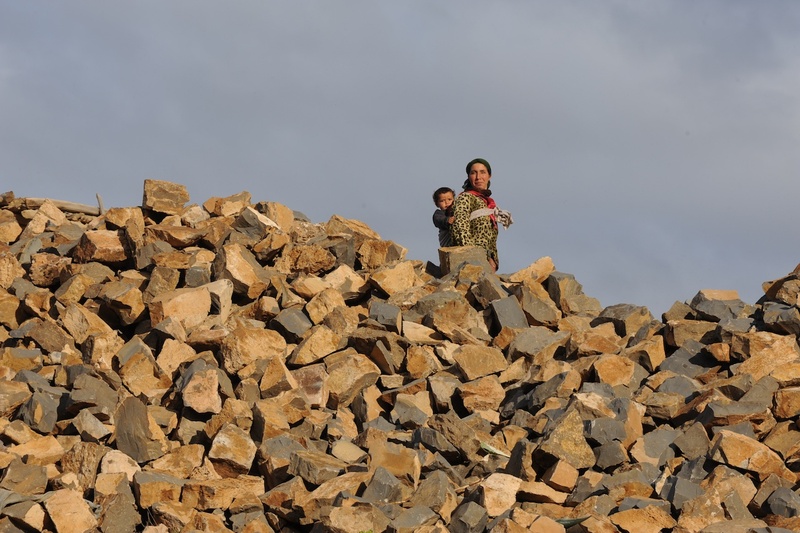 An emergence of rural development has put Morocco’s deteriorating traditional and historic earth and stone buildings at risk of complete loss in favor of quick and easy construction being built to house this development. 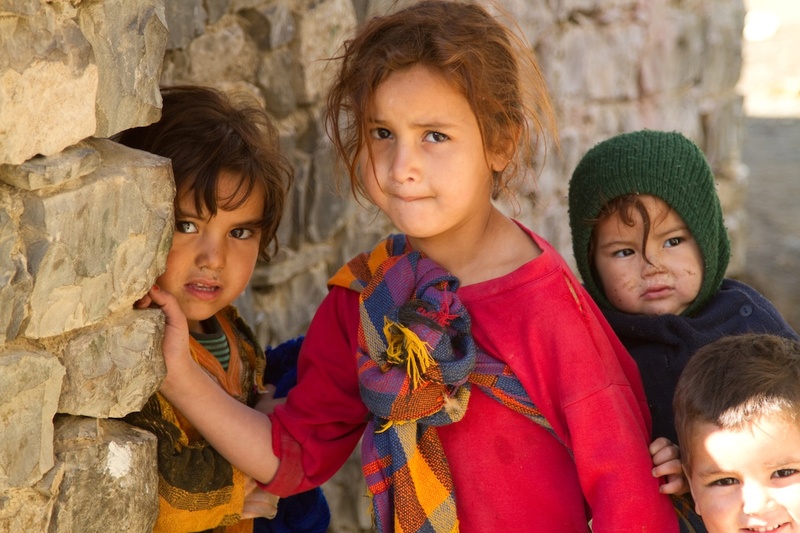 Meanwhile, Morocco’s rural communes are being challenged to find a balance between their traditional cultural identity and the unavoidable demand to become a viable force in their modernizing country. Morocco’s historic fortified granaries, kasbahs, and vernacular architecture hold a plethora of untapped potential for preserving the traditional culture and simultaneously supporting sustainable community and economic development. 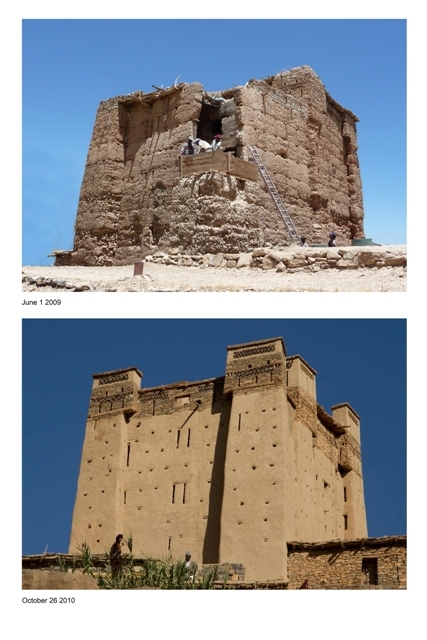 Cultural heritage is a non-renewable resource and if the historical buildings are lost, part of the cultural identity and heritage of Morocco will be lost with them.This research will be invaluable to the parallel advancement of the conservation of Morocco’s rural built heritage and community and economic development. It will contribute a vital component that has been missing: research and outreach about the planning, implementation, partnerships, and long-term management of the conservation projects. 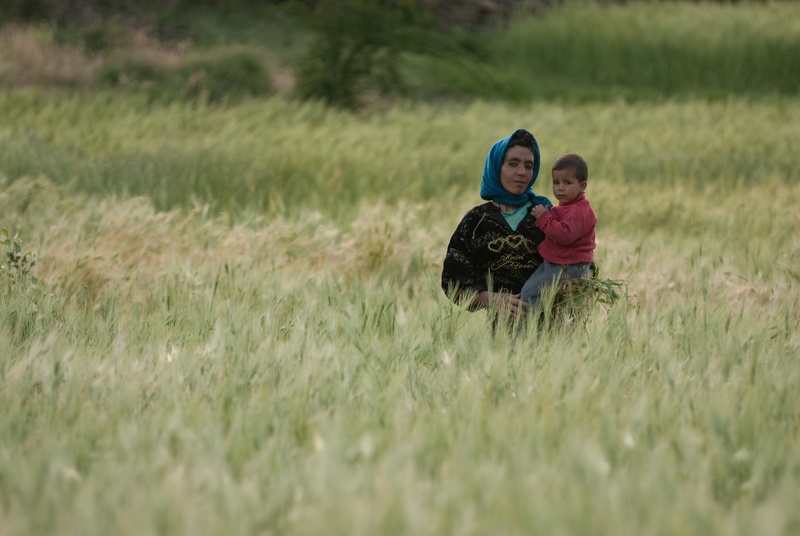 Mother and child in the wheat fields. Children in the village of Amezray n Oozdir. 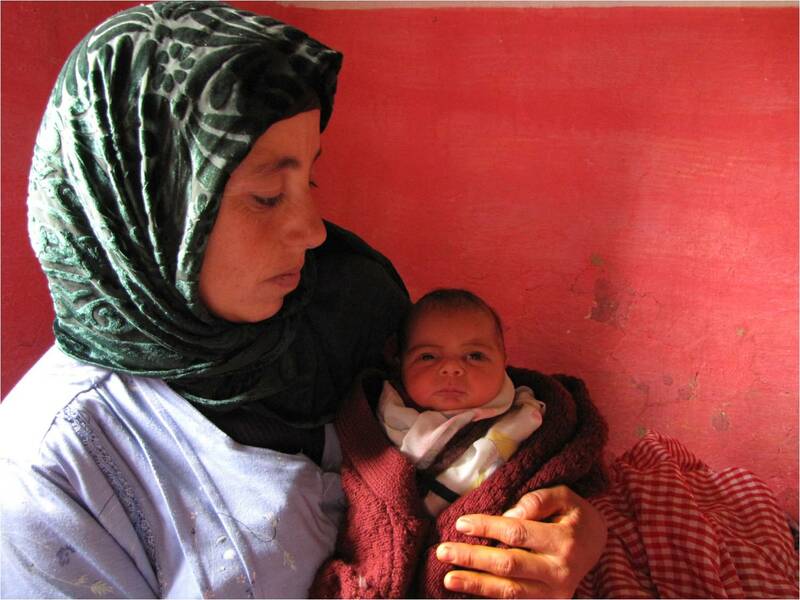 Mother and child in the village of Amezray. Before and after the restoration of the Amezray n Oufila Igherm. North African Scholar Speaks about Regional Turmoil March 3, 4. 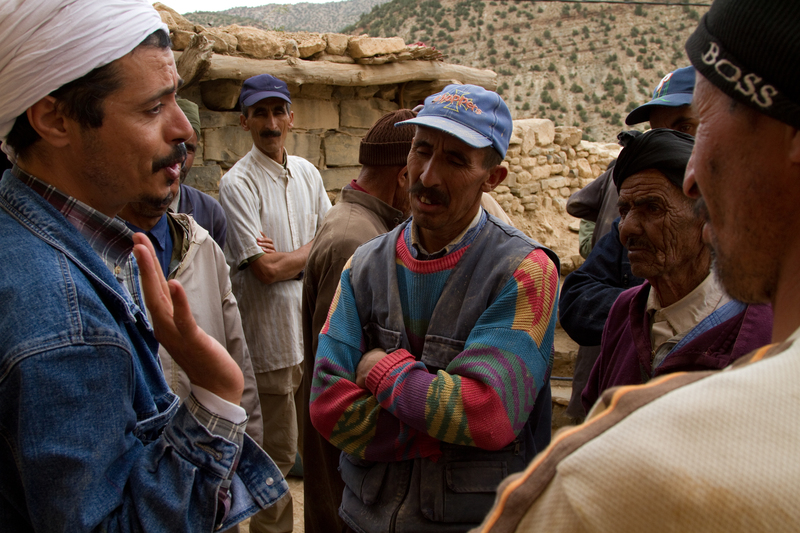 El Qadery speaks at a village meeting in Morocco. Mustapha El Qadery, a renowned North African scholar, historian and anthropologist, will speak about the current political turmoil in the Middle East and North Africa on March 3 and 4 in Bozeman. On March 3, El Qadery will present “The Berlin Wall Falls in the Middle East and North Africa,” at Montana State University, 7:00 pm, SUB Ballroom A. On March 4, El Qadery will present “How Arabism Hijacked Islam,” at the Bozeman Public Library, 12:10pm to 1:00pm. Please bring a sack lunch. Currently, El Qadery is a Fulbright Scholar in Residence at Virginia State University in Virginia. In Morocco, he works at the National Library of the Moroccan Kingdom and in the Faculty of Law at Rabat University. El Qadery has published over 30 papers on his field work which focuses on Colonial and Postcolonial Political Systems in Africa and the Middle East. El Qadery’s latest paper, published in France in December 2010, is titled “Did Africa Lose the North?” El Qadery is now finishing a book, written in Arabic and French, titled Nationalism of the Self-hate, including a specific text about the end of Franco Salazar’s rule in Tunisia. Also a documentary film producer, he was recently awarded two Moroccan film awards regarding his work on the history of the Colonial Conquest in the Eastern Moroccan Sahara. For the past five years, El Qadery has worked closely with Cloe Erickson, MSU alumni and the founder of the Atlas Cultural Foundation, on community development work and an MSU study abroad program in a remote region of Morocco’s High Atlas Mountains. 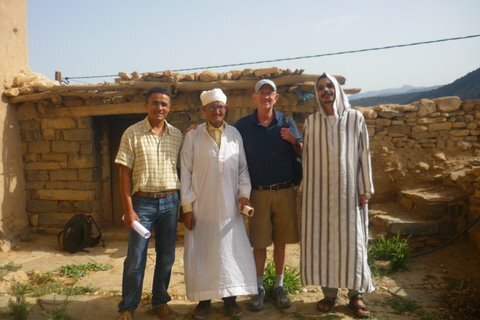 In addition, El Qadery has been a guest scholar for the Livingston-based travel company Bella Treks. El Qadery’s visit is sponsored by the Atlas Cultural Foundation, Montana State University’s Office of International Programs and Bella Treks. Both presentations are free and open to the public. For more information please contact Cloe Erickson, 581-1865 or medina@atlasculturalfoundation.org.